Lift up to 5,000 lbs (4,536 kg). Compact permanent magnets lift and transfer steel and iron without slings, hooks or cables. 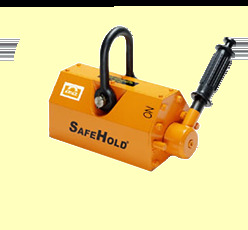 Properly installed and operated, provide greater safety than other mechanical material handling devices. 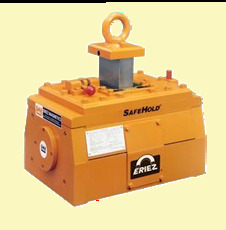 Eriez' SafeHold Lift Magnets are ideal for carrying semi-finished products with flat surfaces such as machine parts, press molds for forming, steel plate, etc. 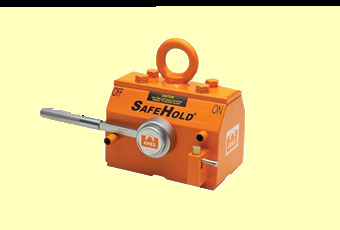 Manually turned ON and OFF by rotating a lever approximately 180 degrees.